Machines or percolators are both quick and hassle-free ways to make coffee. Especially at the crack of dawn while half awake, any type of coffee is good coffee. Well, it certainly feels that way when the senses are still firing up. We all know how easy it is to throw a filter and some grounds into a machine and let it do its thing. I hate to break it to you, but that “thing” involves a filter that removes the good stuff and heat that may or may not be happening at the right time. And in what world does the easiest route ever yield the highest quality? All of that being said, I want to encourage you to try your hand with a new process. To get you started, I’ve compiled some of the best French press coffee makers in 2019 for you to scrutinize. So, Why Should You Take Extra Time in the Morning Making Coffee with a French Press? Many coffee aficionados argue that using a French press yields the best taste. It certainly sounds fancier, but there’s a lot more behind it than that, including a colorful history that boasts a patent by an Italian man named Attillio Calimani in 1929. Did you do a double-take on that nationality? Good. It is called a French press, after all. It’s theorized that it was invented by a Frenchman, but patented by an Italian, cementing that boot-shaped country’s association with coffee. Originally, French presses were made using cheese clothes starting way back in the early 1800s. A man attached the cheesecloth to his coffee pot so the grounds wouldn’t end up his cup. This innovation advanced quite nicely with the times after that. The general concept is the same even more than 200 years later — steeping the coffee in warm water and straining out the grounds. In 1958, the patented French press was taken on by Bodum, a Danish company who’s still trusted for French press needs to this day. Since being patented, the French press hasn’t changed much, but the idea is simple and effective. French presses now are made out of heat-resistant borosilicate glass or stainless steel. Rarely, you’ll see some made of stoneware. Ultimately, when it comes down to it, choosing the right one for you will rely heavily on personal preference, aesthetics, and reading the reviews for weird quirks. Okay. I’m going to level with you. It takes a damn good reason to make me spend extra time doing anything before 9 am. And doing that something before coffee seems like pure nonsense. I’m incapable of functioning pre-coffee. I grunt like some prehistoric neolithic caveman with no other means of communication. Even if it’s a simple single serve machine, It takes every ounce of cognitive function to pop a Keurig® cup into the machine and let it do its thing. It wasn’t until I tasted my first French press cuppa joe, made by a fellow coffee-lover, that I realized that it actually matters how the beans are brewed. The first inhale alone is like actually comprehending the infinite possibilities of the universe. It’s more than my dramatic, life-altering experience, though. There’s actually, you know, science behind why French press coffee tastes like nirvana in a mug (when made right). When using a coffee machine or percolator, there’s a lot that happens between the water in the tank and what drips out. Filters, those thin slips of paper between the grounds and your cup, actually soak up the oils excreted as the coffee grounds are heated. Also, unless you regularly clean out your machine, mold can grow in all of the little nooks and crannies. Don’t visualize it too much. It’s one of those thoughts that easily induces a few dry heaves. Using a French press eliminates that worry because everything is visible and (typically) easy to clean. Plus, without that filter in the way, you can drink the coffee with all of its natural oils and enjoy all of the caffeinated goodness. Heat is at the heart of getting the delicious taste you crave before starting your day. Coffee machines and percolators often heat up quickly and cool down just as swiftly. These extreme ends of the spectrum don’t create the perfect environment for the perfect cuppa joe. Much like tea, coffee grounds need to steep to release the nuanced flavor, which is what a French press is made to do. Lastly, French presses are an environmentally friendly way to enjoy your brew. No single-serve pods that take 400 years to degrade, no soggy filters to dispose of, and not much maintenance required other than a quick rinsing. To get all of these perks, you do need to keep a few things in mind. You'll want to use a coarse grind when brewing with a French press, so make sure you have a coffee grinder that has the appropriate settings to deliver a coarse grind. Blade grinders tend to yield inconsistent size grounds, whereas using a burr grinder eliminates that issue. On the fancier side of the conical burr grinder life, you can drop a serious chunk of change. This Hario Skerton Ceramic Coffee Mill is a delightfully affordable way to get the ideal grind for a cup of French press coffee, but take a look at this total breakdown of coffee grinders to read about it more in-depth. You also have to weigh the pros and cons of glass or stainless steel cylinders. There’s something satisfying about watching the water darken and the grounds swirl around in a glass French press, but they can shatter. Stainless steel versions obviously don’t allow for the hypnotic experience of watching grounds dance about in heated water, but they also don’t have the same propensity to shatter. Here are some of our favorites picks for the best French press coffee makers. This little beauty boasts a reusable stainless steel filter, a large handle to keep a good grip on it if you’re traveling, and a black shell criss-crossing over the glass. Whether you opt for the 12 oz. or 34 oz. version of this French press, it’s made with extra thick borosilicate glass with an insulated outer frame. It has a BPS/BPA-free lid, but there’s also no plastic that comes into contact with your morning joe. The detachable stainless-steel filter and dishwasher-safe traits make the KONA French Press Coffee Maker convenient, easy to use, and affordable. It’s made of glass but has a durable black shell shielding it. It’s still made of glass. This SterlingPro French Press has a unique two-screens system that brushes the wall evenly and tightly and also catches any remaining coffee grounds that may have slipped through the first screen. This will ensure that your coffee is completely ground-free! The interior wall of this coffee maker keeps your coffee warm for longer, while the exterior wall remains cool. 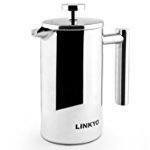 This French press is made with high quality 18/10 stainless steel throughout. You won’t find any plastic on this one! We really like the material of this one, as the stainless steel is sturdier than glass French presses and also much easier to clean. Let’s look at some options on the other side of the French press world — stainless steel. The LINKYO Stainless Steel French Press Coffee Maker won’t let you watch the steeping process, but it does the same job as glass ones — perhaps even better since stainless steel retains more heat. This easy-clean model comes in three different sizes and in two different styles, Classic or Matte. Multiple sizes, ranging from travel to 50 oz. If you want to add some whimsy to your morning brew, the Coffee Gator is a great way to do it. This model comes in gray, orange, pink, and stainless steel — for the record, all four are made with military-grade 304 stainless steel. It’s ultra-thick body has the ability to keep your coffee hot, so you can draw out your morning cup (or three). Comes with a small coffee canister and an e-book — bonuses for beginners. Bodum is a big name in French presses overseas. They make a number of styles, both stainless steel and glass. The BRAZIL is made of heat-resistant borosilicate glass with a 3-part stainless steel plunger. It’s a very affordable, so it’s a good starter French press. Available in both a 34 oz. and 51 oz. versions. This French press arguably provides the best of both worlds — the coffee universe where the biggest divide is between those who live and die by their glass or stainless steel French presses, that is. Made of thick borosilicate glass that’s partially surrounded by 304-grade stainless steel, this forward-thinking design looks as unique as it is. The lid is made of plastic, however it’s BPA-free. There’s also a 4-level filtration system, which one-ups much of its competition. One of these filters is directly in front of the pouring spout as a last defense against any errant grounds winding up in your 2 o’clock-in-the-afternoon fix. It’s stainless steel and available to be delivered in “frustration-free” packaging, like it should be offered with anything but? At any rate, it’s double-walled and uses a dual-stage filter system. The pre-filter catches the coarse grounds, while the super fine mesh filter catches the dregs after its steeped. This model doubles as an insulated serving pitcher, which is great when entertaining or taking your sweet time enjoying your java. Comes in an array of sizes from 17 to 44 oz. I have one more stainless steel option for you to consider. The double-wall design can keep your coffee piping hot and the double-filter technology helps eliminate any acidic flavor from your morning fuel. I blanked on what it’s function could possible be for a solid minute, but for those blasphemous individuals that like to add honey, cream, or sugar to their coffee, this model comes with a fancy utensil to commit the crime with. In my humble, coffee-loving opinion, the Coffee Gator French Press takes the cake in the stainless-steel category. With four filters and military-grade steel, it has the propensity to become the most beloved item in your kitchen. The Cafe Du Chateau French Press Coffee Maker is a fantastic glass-based option, though. Partially surrounded by stainless steel and coming with a lifetime warranty, it’s hard not to love this option. Wherever you start, whichever model you choose, I guarantee you’ll notice a distinct difference when compared to your percolator brew.